Samantha’s mother has been dead for a year when the box arrives on her doorstep. In it, she finds relics of her mother Iris’s past. But as Sam sifts through these keepsakes, she uncovers evidence that her grandmother, Violet, had a much more difficult childhood then she could have ever imagined. And Sam, a struggling new mother herself, begins to see her own burdens in a different light. Moving from contemporary Madison, Wisconsin, to the seedy underbelly of New York in 1900, we come face to face with a haunting piece of America’s past: from 1854 to 1929 orphan trains from New York transported 150,000 to 200,000 destitute, orphaned or abandoned children to find homes on farms in the Midwest. 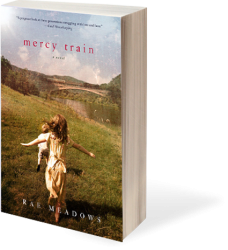 Rae Meadows takes us on our own journey of discovery in Mercy Train, an affecting and wonderfully woven novel about three generations of women, and the surprising sacrifices we make for the people we love. Full Circle Books, Oklahoma City: with filmmaker Lance McDaniel.